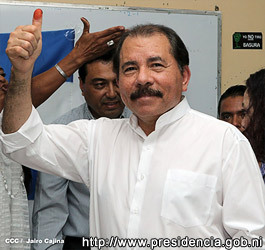 Daniel Ortega - Red thumb up! According to Robert Courtney director of Transparency International (Etica & Transparencia in Nicaraua), 11 of 13 indicators relating to participation in a clean and ethical campaign of suffrage, EyT saw "a systematic violation and failure. EyT who worked with 50,000 unaccredited voluntary observators said: "The failure in these 11 basic international requirements force us to declare that the electoral process is not fair, honest and credible." "On the contrary, we've clearly signs of fraud," said Courtney. Accredited Organization of American States (OAS) election observers called the elections “opaque” and “worrisome” respectively. The head of the Organization of American States observer mission, Dante Caputo, said its observers have been denied access to 10 polling stations, which would account for 20 per cent of the statistical material they had planned to collect for their analysis. The final report hasn't been published yet. Notoriously duplicitous OAS Secretary General Jose Miguel Insulza first stated, “in Nicaragua yesterday, democracy and peace took a step forward,” but quickly backed away from this statement after realizing the true extent of the problem. Unaccredited Domestic electoral observers of Hagamos Democracia rejected the electoral results and said that by the time the polls closed, they had received “close to 600 citizen complaints,” indicating irregularities in 14 percent of the polls. Hagamos Democracia reports that 40 percent of the citizen complaints they received were related to abuse and violence by the police against opposition parties who were demanding access to the polls. Also reported incidents of violence and voter intimidation in various parts of the country. The electoral observer organization IPADE (Instituto para la Democracia) outlined in their preliminary report some of the challenges. IPADE which monitored the elections with some 3,000 observers accredited by the electoral tribunal confirmed the expulsion of 43 opponents prosecutors assigned to polling stations, of which about half belonged to PLI. According to Mauricio Zúñiga director of IPADE, in 34% of the voting centers the Voter Reception Teams (JVR, Juntas Receptoras de Votos, part of the citizen verification process as part of electoral law) did not have access to the final results at their voting centers; 13% could not arrive at their voting centers because of issues such as violence or interference; 20% of voting centers did not have observers from the opposition party alliance; lack of accreditation of observers (national and international); in 20 municipalities voters were systematically intimidated by police and pro-government forces; and finally a general lack of control on the voting and vote counting process. The Carter Center did not officially monitor the 2011 elections but did sent a small study group to visit Nicaragua to listen to the viewpoints of diverse citizens about the electoral process and the future direction of the country. The Center declined to send an electoral observation mission under the restrictive regulations because it was denied access access to all required information sources. The study group stated on November 9th: "We acknowledge the strong electoral support given to President Ortega in Sunday's election. Nevertheless, we are troubled by the reports of significant deficiencies in the 2011 electoral process in Nicaragua and their implications for democratic governance. It is perplexing that a country that is showing social and economic improvement has at the same time permitted an erosion of democratic institutions."... "After more than 20 years of elections, it is distressing that electoral institutions remain so weak in Nicaragua. The report of the observation mission of the European Union documented a wide range of problems. The problems with party poll watcher access, the refusal to credential some experienced national observer groups, and limits on international observers made it difficult to independently verify the official results. Last minute changes in rules, absence of information for citizens and political parties, and vague regulations also affected confidence. All of these things produced suspicion and distrust in the process and the results on the part of important sectors of the population." The Consejo de Expertos Electorales de Latinoamérica (CEELA), a body of (former) voting judges in Latin America, was invited by the Consejo Supremo Electoral (CSE) of Nicaragua to "accompany" or monitor the elections. CEELA accompanied the process with more than 40 staff and ruled out the possibility of fraud already before the day of the elections! The National Council of Universities (CNUCNU was that: "there were weaknesses that are attributable to the elections legislation, the functioning of the Electoral Power and of participating political organizations. The extent and nature of these weaknesses do not affect the validity and legitimacy of the election results." One could ask one self why bother about a little election fraud? Ortega would have won anyway! That's exactly what the mainstream public opinion in Nicaragua is about. I will try here to argue that there was apparently a significant election fraud and that it had an important reason. First of all there was a huge pre-election fraud going on for months, which was swept under the rug by the mainstream media. You can read more about that in my other blogpost. Secondly let us take a closer look at the pre-election polls that were held before the election date of November 6th. On one hand we have the public polls held by the independent agency CID-Gallup and on the other hand we have the FSLN polls that were held by Consultora Siglo Nuevo (CSN) and that were paid and published by FSLN at www.el19digital.com. I consider CID-Gallup (CG) to be more independent and reliable in its election polls. CID-Gallup, headquartered in Costa Rica, offers market research and consulting services in more than 20 countries in Latin American and the Caribbean. CG has an International reliable reputation and I think it's not prepared to sell this by adjusting election polls for bribes. Also I think CG is more experienced and does have more knowledge to determine an accurate population sample than CSN or M&R, because it's a much larger company. There is a clear positive deviation of the CSN polls in relation to the CID-Gallup polls as you can see in the chart below. A constant positive deviation in consecutive polls, means that at least one of the two is unreliable. Deviations in polls allways should be at random. And then the M&R polls. M&R polls are a bit questionable, there are only few and they seem to be more pro-FSLN than the CSN-polls. Raúl Obregón, general manager of the M&R Consultores did say on several occasions in the media that FSLN's aim was to win 2011's elections with 67% victory as it did in 1984. Such statements make your polls suspicious. There is also this remarkable issue about the latest M&R poll. The latest M&R poll held on October 29th showed that Ortega would win with 58% of the votes. This was discussed with unbelieve in the media. The poll was paid by and intended to be published in La Prensa (pro-PLI), but was leaked to Radio YA (pro-FSLN). Due to the outrage, denial and scandal surrounding M&R's latest voter-intention poll, Raúl Obregón said “I am going to retire from electoral polling”. This fits perfect in the disinformation scheme. If a polling agency paid by a pro-PLI newspaper predicts 58% for Ortega shortly before elections-day, then a staggering victory of Ortega would be more acceptable to the people. Obregón's public announcement to quit elections polling adds even more credibility. So no proof, but it's plausible that M&R Consultores was bribed to adjust its polls. We still have to wait for the final reports of OAS and EU observers, but my preliminary conclusion is that it is very plausible that there was a significant election fraud campaign going on. That it was done not to win the elections, but that it was done to win the elections with more than 60% in the first round and that would result in 2/3 of the seats of the National Assembly. It was a long term carefully set out strategic plan that included pre-election frauds, obstructing domestic and international monitors and that contained disinformation campaigns. Probably with funding and advice from Venezuela, if not orchestrated. It is said that Ortega suffers from an extreme sensitivity to sunlight triggered by the medication for a mysterious blood disease for which he regularly seeks treatment in Cuba. This is why he is rarely seen in broad daylight lately. One has to fear that most of his future deeds can't stand the daylight either. What will be the consequences if observer reports say that election fraud did happen? Then Nicaragua is clearly violating the OAS Inter-American Democratic Charter. "Unconstitutional alteration or interruption of the democratic order in a state of the Hemisphere constitutes an insurmountable obstacle to the participation of that state's government in the Summits of the Americas process". Nicaragua could be expelled from OAS. US/EU Administrations will not recognize the election as free and fair. Foreign aid will further decrease but Venezuelan aid will increase as long as Chávez is president. Increasing Venezuelan aid will mean more Venezuelan influence on Nicaraguan politics. Maybe some expropriations of foreign investments will happen in the next five years. The gold mining industry could be a start. The End Of The Chávez Era? © LatAm-Threads. Simple theme. Powered by Blogger.